There is no in-game mechanic that says "You punch the goat in the face", but when you successfully win a Monster Space there's no harm in narrating the victory a bit. I gather, since Andi’s at the bottom of the mountain, that a goat is the equivalent of a Level 1 encounter in an RPG. Amanda is still the new one here, and trying to kick others away to take the attention they already get–which this feels like it’s turning into–isn’t friendly or welcoming. Didn’t she say in a previous strip (621) that she really wants to win against Selkie? To Amanda, and in this context, “winning” would be a complete reversal of fortune where Selkie is left alone and hurting while Amanda gets the love and attention that she feels she deserves “more”. Not a good sign, kids! Unless Amanda starts calling Selkie useless I don’t see how Selkie would gain emotional support from the family because she’s losing. At the moment I think they’re both on the same spot. Selkie used strategy to block Amanda and now Amanda is using strategy to deal back the damage to Selkie. As far as I can see, the girls both used tactics against one another and there’s nothing wrong. Amanda actually seems quite calm right now. She had a laid back expression and casual tone (if the expression matters I assume the tone matches that is) while rolling. Then she changed from laid back to confident and competitive again, but I think she’s sneering not in necessarily a malicious way here, I think she’s actually just having fun and is being jokingly mocking. Not necessarily in good taste, but she IS getting revenge for the rockslide, I assume Selkie would have a similar reaction. “Gots a presents for yous.” seems right up her alley. It seems to me that Amanda is saying, “You thought you got the upperhand, but I’m not out yet, here’s a little payback.” in the spirit of competitiveness. She will likely go overboard eventually though. I truly think Amanda sort of likes Selkie and has only convinced herself she needs go hate her to keep up appearances and as a mental shield for herself. The two of them could be very close friends given enough time and emotional support from their family. Once they get to the root of Amanda’s problems I think it’ll become much easier for her to like Selkie. Perhaps if she DOES win and gloat, she’ll freak out and possibly remember a time where if she beat her adoptive brothers at anything they would punish her and then her adopted parents would punish her; opening the door to discuss her mental trauma. Selkie looks pretty darn mad. Careful, punch too many goats and then flowers will start insulting you. Mort: I’m more worried about the goats pushing me off the mountain trail, or leaving me little smelly presents. I am hoping that Andi’s punching suggestion doesn’t become prescient. Cause I’m waiting for an adult to nip this in the bud, but it just escalates. Panel 2: textbook example of an evil smile. Let’s see, Amanda just used her last lasso, and it looks like neither girl is on a cave space … it’s be too bad if the dragon came to life again and sent them both back to the start, and one of the adults winds up winning. That´d be a wonderful lesson, wouldn´t it? “If you waste all your effort on fighting each other, neither of your will win”. It depends on the situation … if Selkie is close enough to the finish line that she would probably win her next turn, then playing a lasso now is a good play. 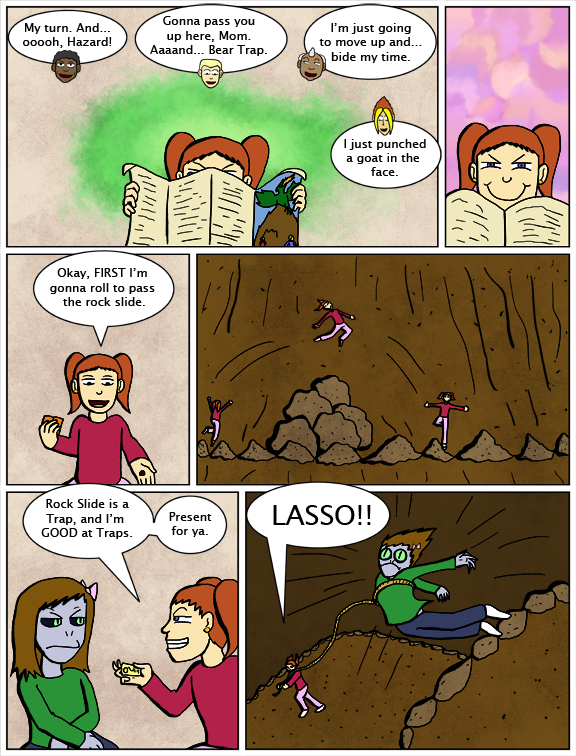 If Amanda’s only playing the lasso to get revenge on Selkie for the rock slide (which didn’t really slow her down that much), then it’s not a good play. I’m not so worried about Amanda’s competitiveness here. Sublimating aggression in a board game is a good thing — as Mari knows. You can’t tell a child not to feel rage. You can give her the experience of expressing anger in a socially acceptable way. I’ve changed my mind — the best outcome here would be for Amanda to win by using her wits, and find herself being congratulated and admired for it. I want her to have that. As for Selkie? She’ll live. She feels secure here. She might grumble or sulk a bit, but she can handle losing a board game, fairly, even to Amanda. Yeah. Honestly, this is a much better way for Selkie and Amanda to compete. And it’s not like Selkie wasn’t banking on Amanda not knowing the game well enough. I don’t think she was cheating or anything, I just think she pulled that pit trap hoping Amanda wouldn’t realize how easily she could pass it. Amanda is down to her bear trap card. . . and Selkie is down to two unknown cards to us (and also Amanda. . .). I love how the lines in the first panel are just so indicative of their characters. I also love Amanda gleefully jumping over the rock slide. Heh called it! Now to see what she does with bear trap. It would almost be awesome if there was a card that says “You also win if you stand on this square when another person wins.” Double victory. Or even better a card that say “You can only win if another person you are bound to also reaches the finish.” Forcing them to work together to win. The three-dimensional strategy here just makes me think it’s an even better game design idea than I thought when it first came up. That grin, I have seen that grin so many times at DnD.